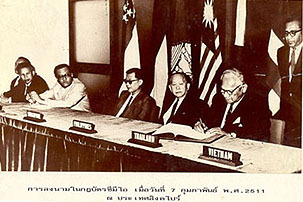 The signing ceremony of the SEAMEO Charter took place at the Singapore Conference Hall during the Third SEAMEO Council Conference in Singapore, 1968. The SEAMEO Charter was prepared by a group of international lawyers and was earlier submitted for clearance by the Member Countries before the signing. The Ministers of Education of Indonesia (Soemantri Hardjoprakoso), Laos (Leuam Insisienmay), Malaysia (Mohamed Khir Johari), the Philippines (Carlos P. Romulo), Singapore ( Ong Pang Boon) and Thailand (Pin Malakul) affixed their signatures to the Charter on 7 February 1968. It was signed later by Republic of Vietnam (Nguyen Van Tho), 28 June 1968.